What makes a good sales presentation? An effective presentation tells a compelling story, highlights your value proposition, and aligns with your audience's needs and desires. It ends with a strong call-to-action. Hate the thought of doing sales presentations? You’re not alone. But the best reps have sales presentations down pat, even if it’s not their favorite activity. The best sales reps know that when done right, sales presentations are a high-earning skill. So, let’s hone that skill with 14 simple sales presentation techniques that communicate an irresistible narrative and get buyers to close. Arm your sales team with a compelling presentation that will help turn prospects into customers. Be honest. Internally, you read that title and said some version of "No way." Am I right? Well, know this: I only preach what I practice. When the Gong.io team started sharing our deck before opening sales calls, we learned it’s a winning move. You might assume that sending a buyer the deck before a call is like revealing whodunnit on the cover of a murder mystery. No one’s going to pay attention to the rest of the book, right? If your deck is compelling, prospect’s will want to get into it with you, even if they know the main point. Together, you can dive in, dissect the good bits, and talk through questions. It’s going to be a juicy conversation and they know it. If you want to see how closely your buyer paid attention to your deck, start your call with, "Based on the information in the deck I sent, where should we start?" Don’t worry if they didn’t review it. They’ll just tell you to take it from the top. Nothing’s lost except their opportunity to jump into a deeper conversation faster. That’s what you’re after: a top-tier discussion, right off the bat. You can get into one much faster, if your buyer has seen your deck and is ready to talk about it. It saves everyone time and kicks the sales process off to a quick start. It’s tempting to stick to a positive and linear story during your sales presentation. That usually involves talking about benefits, outcomes, and desired results. But that approach is a mistake. Before you discuss solutions and results, you must understand the problem. More importantly, you have to be sure your prospect understands (read: admits to) the problem. Self-discovery is the ticket that gets you there. Instead of telling your buyer what the problem is and how you’ll address it, get your buyer to connect with the problem on their own. Tell a story in which your buyer is just like the main character. 3. Talk about Point A. Don’t skip to point B. This tip is 100% linked to the last one. There’s a problem (Point A) and a desired outcome (Point B). Point A is the status quo. It’s the problem your buyer will continue to face if they don’t make a change. Would it surprise you to know that 95% of messaging focuses on Point B (shiny outcomes) instead of Point A (the problem)? Switch the focus of your presentation to Point A. Talking about a pain point is shockingly more effective than talking about positive outcomes. That’s because of one simple principle called loss aversion. Here’s the quick version: People will work twice as hard to avoid loss as they will to gain benefits. Focusing on Point A triggers loss aversion, and the natural human reaction to loss aversion is a sense of urgency. Now you’re getting the inside scoop on deal-closing sales presentations. Make your buyer feel the pain that results from the status quo. Convince them the pain is only going to get worse without your solution -- because you know that to be true. You should only talk about benefits once they’re on board with that line of thinking. Urgency is what allows benefits to land. Without urgency, benefits are just happy points that hold no real meaning. Buyers are the experts on their company’s circumstances. But they want insights into their situation from you. You’re most likely to impress a buyer by telling them something new about themselves. They’re bogged down in their own perspective, and your shiniest offering is new insight into their problems and opportunities. They can get common information about your product’s benefits from a brochure, thank you very much. But an insight into themselves? That’s worth its weight in gold. You learned how to get more distance from your golf swing (an insight into what you’re doing). Then you learned how that’s supported by the product’s particular strength. Insight comes first. It changes how your buyers think about the problem your product solves. Only then benefits can land effectively. Think about what makes your product unique. Nothing you say about differentiators matters, if your buyer doesn’t value that differentiator. So, how do you get buyers to care about your unique strength? Help your buyer understand a problem or opportunity they’ve missed. Educate them, and be sure the solution relates to your differentiator. At Gong.io, we’ve taught our sales reps to speak with buyers about an important problem only we can solve. 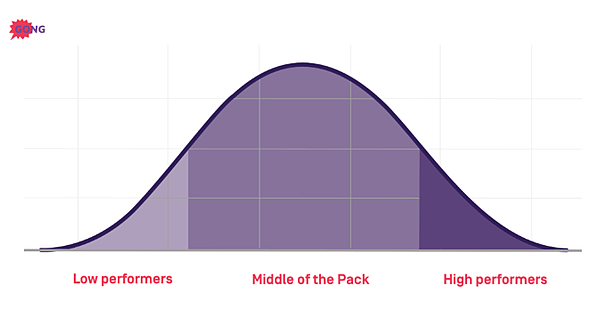 It’s the delta between top producers and the rest of the team. "The numbers from your top reps are fantastic." "The downside is they’re annulled by everyone else who’s missing their quota." "Your team goes from outstanding numbers to breaking even or missing quota. Both of those options are unsustainable." "Gong is the only platform that can tell you what your top reps do differently from the rest of your team. We can tell you which questions they ask, which topics they discuss, when they talk about each one, and more." See why we lead to our differentiator, and not with it? It just wouldn’t land the same way if we started with the differentiator. In fact, it might not land at all. Remember this the next time you open your mouth in a meeting: You get delegated to the person you sound like. Focusing on specs and features is a poor sales strategy that gets you booted from decision makers. Time for a reframe. 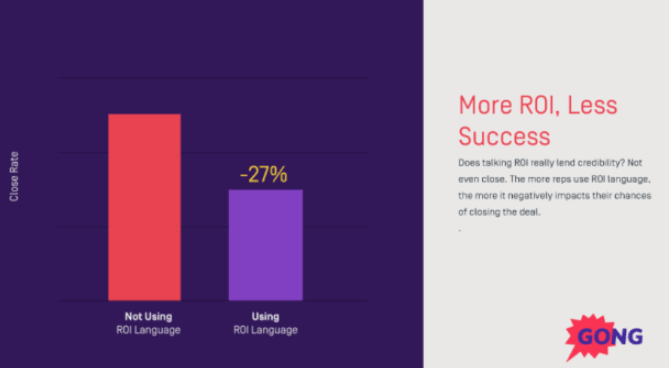 When you talk about your value prop, use language that reflects strategic issues. That’s what resonates with executives. They want wins for corporate business problems, not tech snippets in the trenches. If your solution relates back to those problems, you can sell to the C-suite. There’s an incredibly predictable bent to most presentations. They’re logical and they flow from one point to the next, eventually achieving a shiny, final outcome. This is a great way to set yourself up for failure. Logic works when we introduce people to new topics. It’s used at all levels of the education system. But it doesn’t work well for presentations. 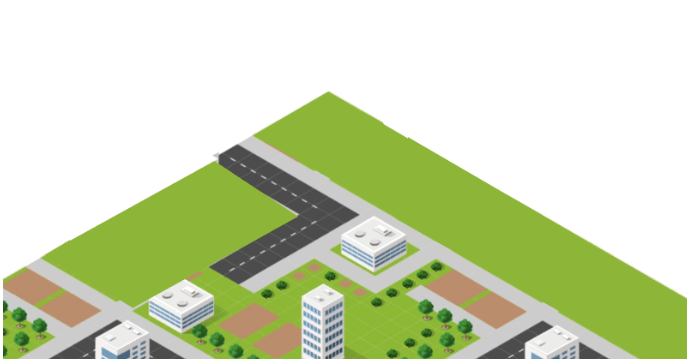 Here are two presentations for constructing a new city. The first one is logic-based, and the audience is a big-wig politician. "Sure, it’s a barren patch of earth right now. But hold on to your hat! We’ve envisioned a transformation: new buildings, roads, sidewalks, greenery. A day when our first stop light appears." "And if we take that a step further, we get to the good part. There’s an economic boom coming, and pretty soon we’re going to have homes and local businesses moving in. There’s going to be a big box store around the corner in no time." "Growth begets growth. 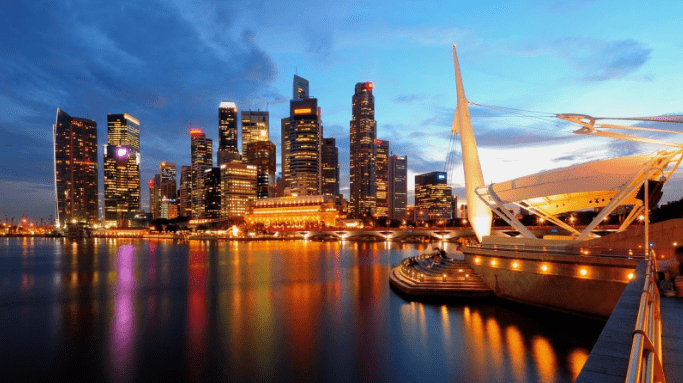 New enterprises will emerge and eventually, we’ll have a metropolitan centre that will amaze and astound you. According to our plans, in just a couple of decades, that empty plot of land will have turned into a booming, gorgeous city rivaling Manhattan!" There’s a lot of build up. A lot of anticipation. And it’s all built on logical progression. But it took so long to get to the point, and that’s the wrong approach when you’re dealing with busy politicians. Or, in your case, busy decision makers. "Ms. Politician, we’re pleased to present our audacious dream for a new city. We’ve set out a plan and determined that if we stick to it, in just a few decades, our city will look like this:"
"We’d love to have a conversation about our plans in any level of detail you like. Big picture or granular, let’s talk about what’s interesting to you." The main difference in the second example is that it started with the end result. The conversation unfolded after the seller revealed a big outcome. Of course, we know these conversations sound different in real life. But you take our point, right? During a presentation you want to reveal an outcome first and let the conversation grow from there. There’s one other tactic underlying it all: The best product demos start with topics the buyers highlighted on the discovery call. Your product demo should mirror those important topics back to the buyer. Start with the most important one first, and work your way down as the conversation moves along. This is something the team at Gong saw repeatedly in our analysis of winning product demos. In the opening section of your presentation, address the biggest issue from discovery. Address the second biggest issue second, etc. It’s called solution mapping, and it’s going to change your sales presentation process forever. Stop saving the big reveal for last. Stop building anticipation. Start with the good stuff. Let it rip right out of the gate. If you sensed we’re looking for a two-way dialogue during your pitch, you’re right. That’s a relief to most salespeople, especially the ones who hate delivering traditional presentations. If you look at this through the lens of a talk-to-listen ratio, it’s terrible. So much talking. So little listening. That means the rep isn’t asking the right questions, or getting long enough answers. Picture that conversation in your mind. It’s connected, and real, and both people are fully engaged participants. That’s exactly how you want your buyer to behave at this point in the process. This tip is crisp and clear: Don’t present for more than nine minutes. Presentations for lost deals last an average of 11.4 minutes. Why does anything over nine minutes go poorly? Because humans don’t think well for that long. Our brains call a timeout at the nine-minute mark. When you hit the nine-minute mark, you need to change channels in your buyer’s brain. You can do that by switching up who’s speaking in real life or on a video or demo. That resets your clock to zero and you’ve got nine more minutes for the next portion of the show. Ignore this rule and you’ll lose your buyer for good! Social proof. Best friend or worst nightmare? It can be either one, so use it carefully. Generic social proof (i.e., naming impressive clients for brand power alone) is a disaster. Try it and your close rate is likely to drop by 22%. 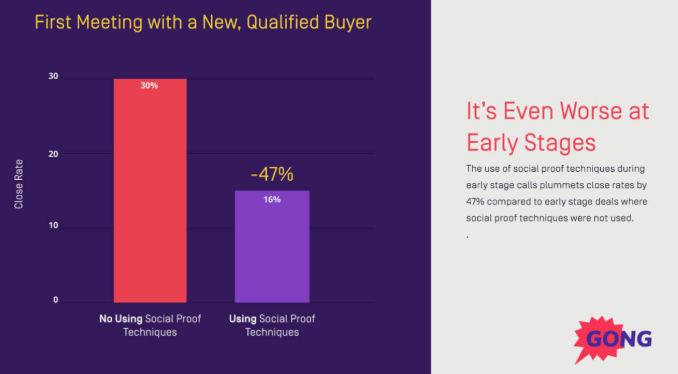 Early stage calls are the worst time to throw down generic social proof. That move will earn you a 47% drop in close rates. What’s happening here? Why is it so damaging to name two or three mega clients to regular buyers? Simple: The regular buyers don’t identify with big-name brands. Sure, they’re dazzled that you nabbed those clients. You’ll probably get some impressed nods in your meeting. But internally your buyers are thinking, "Wow. Google is their client?! Clearly their product isn’t designed for me." 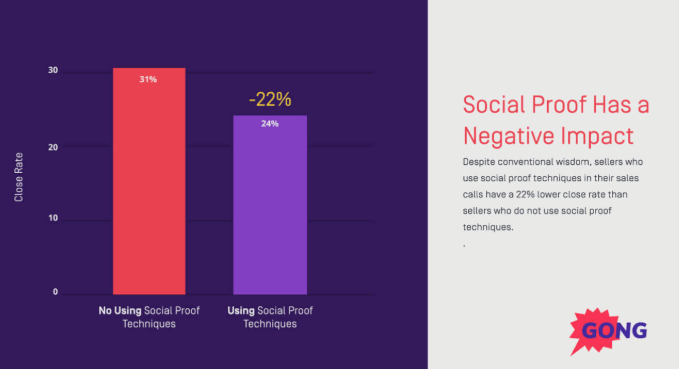 Here’s a much more effective strategy: Use tribal social proof. Clients who belong to your buyer’s tribe have the same pain points, challenges, and needs. Instead of naming a couple of magnificent clients, evoke tribal social proof by naming six same-tribe clients. The best reps rattle off half a dozen or more, when they’re using this technique. If you don’t have that many, you can get away with naming clients from a different tribe. But you have to know what you’re doing. You have to tell an accompanying story about the client and their pain points must match the buyer’s. Otherwise, forget about naming clients from different industries. The reason you’re naming these clients in the first place is so your buyer will see themselves in the customer story you’re telling. Keep reading for more tips on customer stories that sell. 11. Ditch ROI calculators. Use customer stories. ROI has a deep psychological hold on plenty of salespeople. They think these cold, hard facts are hard to ignore. 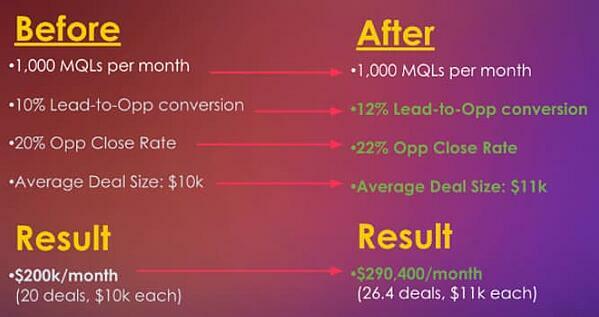 But they missed the memo that says using ROI during the sales process leads to a 27% drop in won deals. That’s true at any point in the process, and I’ll tell you why. It’s connected to how human brains work. We process information in two ways: logically and emotionally. Discussing ROI triggers the wrong process. ROI awakens the logical processors where critical analysis and debate happen. When you talk about ROI, your customer’s brain can’t help but argue with your assumptions. It’s a natural reaction when you trigger their analytical system. Instead, provoke your buyer’s emotional brain, because that’s where buying decisions happen. Do that by telling a before-and-after customer story. It’s a tactic that doesn’t stir any arousal in your buyer’s logical brain. It sneaks into their head and makes a point without setting off any alarms. And don’t get so excited about the "after" results that you forget to mention the "before" metrics. The contrast between "before" and "after" is where buyers learn about your product’s value. One of the reasons this works so much better than discussing ROI is that there are no assumptions to argue over. Your story stands entirely on its own and buyers understand it at face value. The trick is to get your buyers to see themselves in that story. If they do, your job gets a lot easier. They’ll be ready to sign in no time. Would it surprise you to know it matters when you talk about certain topics? It can actually affect whether you win or lose a deal. Pricing is a great example of this principle. The top salespeople wait to talk about pricing. They know it’s important to demonstrate their product’s value first. You can get into real trouble if a buyer decides they want to talk pricing early in the call. Set an agenda at the start of your call, so your buyer knows when to expect a pricing discussion. They’ll be less likely to raise it early, and if they do, you can refer back to the agenda. Open with something like, "I’d like to talk about A, B, and C on our call today. Then we can go over pricing at the end and -- if it makes sense for you -- talk about next steps. Does that work for you?" This is one of my favorite competition-crushing techniques. It’s easy to focus on your competition’s weaknesses. That’s why most salespeople do it. A more sophisticated technique involves using their strengths against them. Mentioning your competitor’s weaknesses leaves you vulnerable to attack. Your buyer can dispute or correct your points. What if you could show your buyer how your competitor’s strengths make their product a poor fit? That’s exactly what one of the biggest names in the fast-food business did in the mid-1980’s. By 1985, McDonald’s was losing market share to Burger King, and their marketing teams were going head to head. That’s when Burger King decided to take down everything McDonald’s promoted as its strengths. McDonald’s branding was highly focused on being the place for kids. From Happy Meals and Play Places to Ronald and his friends, McDonald’s was undeniably kid-oriented. The genius marketing crew at Burger King framed their counterpoint: it was the place for adults and real burgers, not just "fun food." Knowing your competitor’s strengths is just as important as knowing their weaknesses, if you know what to do with that information. Sales jiu-jitsu in your back pocket. Here’s another way to use the competition to win deals. Talk about them. 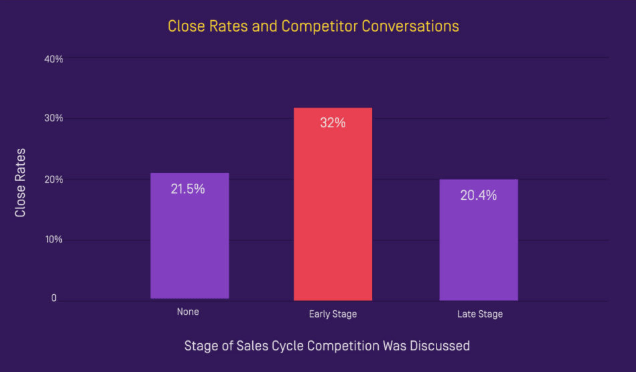 Our data shows that you’re more likely to win a deal if you talk about the competition early in the sales process, instead of ignoring them completely. For best results, practice this during your first sales presentation. Waiting until the end of your sales process puts you into a dangerous red zone. Your buyers will already have formed opinions, and they’ll be harder to change. Sales managers, pay particular attention to this one and jump into competitive deals early on. We love these words from Geoffrey Moore, who wrote "Crossing the Chasm:"
In other words, at the end of the day, buyers will justify a decision they made early in the process. That’s why it’s critical to set yourself up as the winner early on. Talk about the competition in your presentation. Put the conversation out there. Get your buyer to see you through that lens, and you’re golden. You have 14 new tips and techniques to throw down this quarter. These data-backed moves are straight out of our own playbook and have proven highly effective. Implement them all and I know you’ll boost your numbers. Want to keep reading? Check out these tips for ending your presentation with a bang.